Afghanistan's New President: 'Hold Me Accountable' : The Two-Way Ashraf Ghani Ahmadzai takes over from Hamid Karzai after a disputed election that forced a unity government with rival candidate Abdullah Abdullah. 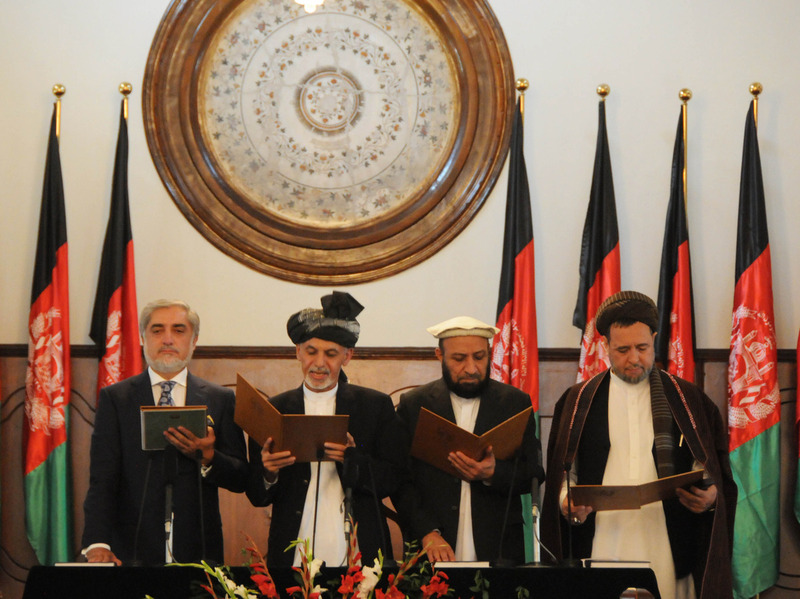 Ashraf Ghani (second from left) stands next to Afghanistan's Chief Executive Abdullah Abdullah (left) and two deputy officials as he takes the oath during the inauguration ceremony at the presidential palace in Kabul on Monday. "Hold me accountable" is the message from Afghanistan's new president, Ashraf Ghani, who took the oath of office today, succeeding Hamid Karzai, a leader many accused of lacking accountability. Ghani's accession to leadership in Afghanistan follows a protracted dispute with his rival in the presidential vote, former Foreign Minister Abdullah Abdullah, who accused his opponent of vote fraud but later agreed to a power-sharing arrangement. "I am your leader, but I am not better than you. If I make mistakes, hold me accountable," Ghani told hundreds of dignitaries gathered to witness the inauguration. As The Washington Post notes: "The new unity government is inheriting an Afghanistan rife with immense challenges. Most foreign troops are scheduled to withdraw by year's end and the Taliban Islamist movement is mounting a resurgence in many areas of the country." Underscoring those concerns were reports that a Taliban suicide squad attacked a local government headquarters in the country's eastern Paktia province, killing 12 people, Al-Jazeera reports. Also on Monday, White House senior adviser John Podesta said Washington and Kabul are expected to sign a long-awaited security agreement Tuesday allowing 10,000 U.S. troops to remain in Afghanistan past the troop-withdrawal date at the end of this year.